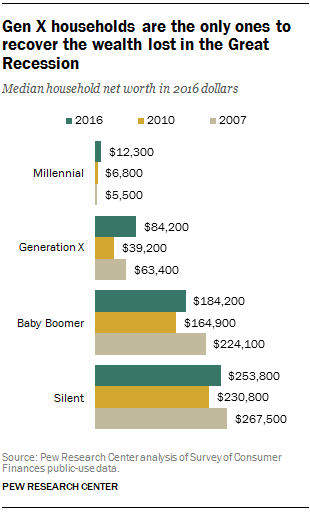 Wealth tends to rise most rapidly at younger ages before peaking once people reach their early 70s. 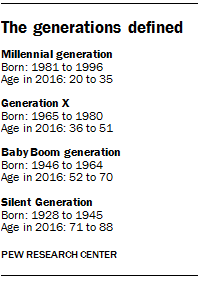 The more robust wealth recovery of Gen Xers compared with the older Boomer and Silent generations fits this pattern. Wealth, or net worth – the difference between the value of a household’s assets and debts – is an important dimension of household well-being because it is a measure of a family’s “nest egg,” resources that can sustain members through job layoffs or emergencies as well as provide income during retirement. 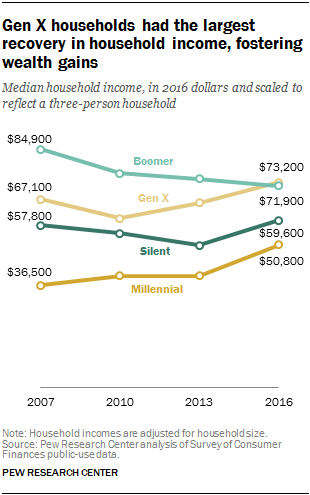 For many American households the bulk of their wealth is in their home, and this was especially the case for households headed by Gen Xers (then ages 27 to 42) in 2007. 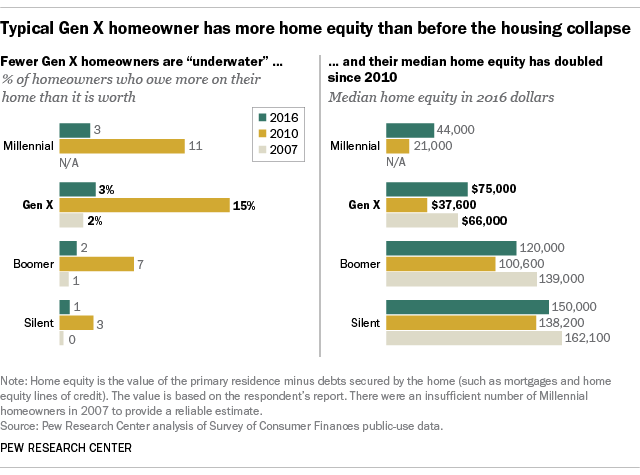 About half of the assets they owned were in the value of their primary residence, whereas households headed by a member of the Baby Boom or Silent generation had a higher share of their money in financial assets such as checking or retirement accounts. Through first-hand experience Gen Xers learned the painful consequences of economic contractions. At least in terms of wealth, they are now better positioned to weather the next one.